For over 30 years Greenscapes has increased the beauty and value of Manasota homes and businesses, from modest properties to grand estates, by designing and installing beautiful landscapes. Few jobs are too large or too small for us. We can simply provide your yard with some seasonal color or we can design and create a statement garden for you. Selecting and planting turf, plants and trees which reflect your taste, can thrive in the setting and provide needed function, e.g. privacy, shade, safety. Installing paths, walls, terraces, patios, steps, boulders, etc. to shape your outdoor space and to direct people in and around the landscape. Selecting the right kind of irrigation, either low flow, such as drip line or microspray, or high flow such as fixed spray or rotor, or a combination of the two. 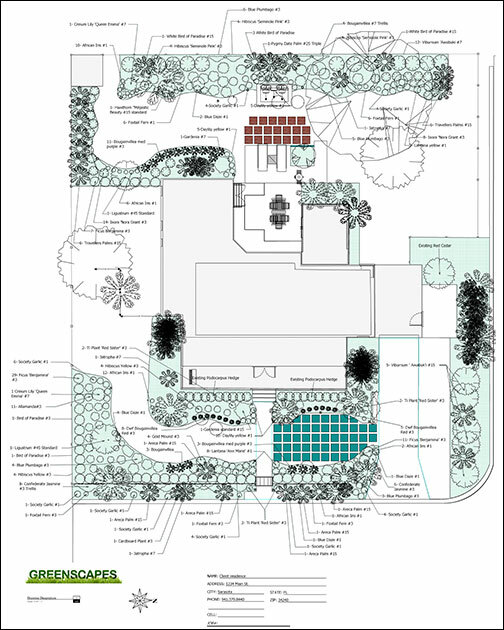 Designing and installing a system which maximizes cover and minimizes water wastage across the entire greenscape. 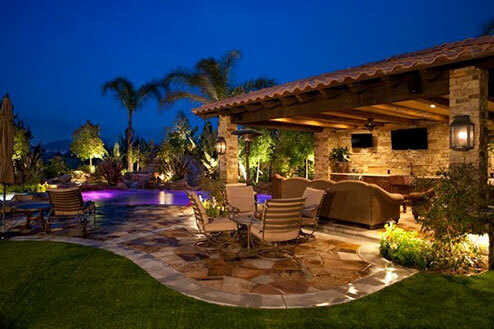 Planning and installing the right combination of path lighting, accent lighting and function lighting to enable full enjoyment of your outdoor living area after dusk. Helping you to choose hidden lighting or statement lighting to suit your taste and the character of your garden. We can create and print 2D designs for you to sign-off which you can also use to seek needed authority and/or grants. For larger scale jobs Greenscapes can also craft 3D interactive videos which allow you to see what your landscape will look like surrounding your specific house/building. The 360 degree tour will enable you to immerse yourself with every detail of our design and modify it as you wish. By spending 5% of the value of your home on the installation of a quality low maintenance landscape, you could boost the resale value by 15%, earning back 150% or more of your landscape investment. Source: Taylor, C. 2003. "Fertile Ground". Smart Money, March 2003. Homes with landscaping ranked poor relative to neighboring homes with excellent landscapes could expect a sale price 8 to 10 percent below equivalent homes with good landscape appeal. Source: Henry, Mark S. 1994. Journal of Environmental Horticulture 12(2): 65-70. Beautifully presented outside spaces can close a house sale. If you are planning to sell your property in this competitive market and want to realize your best sale price, speak with Greenscapes about our Designed to Sell Package. "My husband and I contacted Greenscapes after we bought our new home which had a less than stellar looking garden. We needed help to make it beautiful. I described to their Installation Manager what I was looking for - plants that would give me a lot of color year round and would cover the not-so-great looking fence in a very short time. I gave him some idea of plants I like but, as I am new to Florida and not so well versed on which plants grow well here, I told him to bring me his suggestions. I also showed him areas in the front of the house that needed help. The Installation Manager listened carefully and shortly afterward presented us with a detailed plan. I had lots of questions and he addressed them all patiently. I also thought the price was reasonable. I was in the North East when the work was done. The irrigation system had to be changed due to the new plantings, and Greenscapes had an in-house irrigation specialist, so I did not have to get involved which was very helpful. I just recently got back to Florida and saw the finished work. It is stunning! The front of the house looks lovely. The curb appeal of my house has improved dramatically. Plants have been artfully arranged around an existing rock, I am really pleased with the result. The back of the house has turned from a dire looking area to one bursting with color. The difference is amazing - and Greenscapes did all that without much input from me. I wholeheartedly recommend Greenscapes for any landscape gardening project. The Installation Manager is an artist who is pleasant to work with, open to suggestions and makes the project easy." "Thank you Greenscapes. Our garden looks really beautiful! I wanted to refresh my front and back gardens. I asked a few contractors to give me a proposal. I liked Greenscapes' approach the best. Their Installation Manager sat down with us, asked questions, listened, gave his ideas and even showed us pictures. He asked if we had a budget. He was very patient and knowledgeable. After that, Greenscapes gave us a fully costed plan, which stayed within our budget. Once again their Installation Manager met with us and took us through the proposal. The price was really reasonable. The work was scheduled promptly. The workmen, like the manager, arrived on time. They worked cleanly, quickly and courteously. They were great! They ripped out materials, transplanted some plants and planted blue flax lilies, knockout roses, loropetalum, variegated arbicola, magnificent crotons, bougainvillea and lots of other shrubs and colorful flowers. The gardens turned out just as I wanted them. 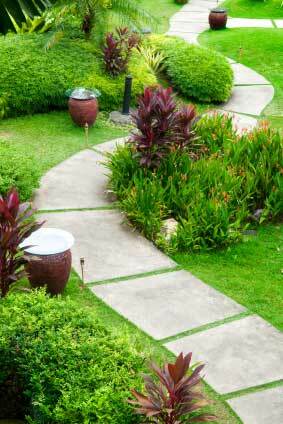 I have already recommended Greenscapes to a neighbor who saw our new garden and was impressed." “Greenscapes did a one-time full yard cleanup that included trimming of shrubs, pruning of date palms and bougainvillea, edging, weeding, lawn mowing, and removal of debris. One of our neighbors recommended Greenscapes to us. I had an event planned for October 19, so I wanted my yard to look fantastic for the occasion. I called Greenscapes on October 14 and I got an appointment for an estimate for Tuesday. On Tuesday, one of their Operations Managers came to our house and reviewed the work we wanted to get done. He was so nice, and we could tell he really loves what he does. Since we were first-time homeowners, he spent time guiding us on every aspect of yard maintenance. By Tuesday evening they had already sent me written estimates for the one-time cleanup and an ongoing service plan customized to our needs. They were able to schedule the cleanup for Thursday, and kept me informed all the way. On Thursday, the crew started the work. They worked quietly, and very efficiently. I had to run some errands, so one of the guys cleaned up all the leaves so that the wind wouldn't blow any leaves into the garage.